Thanks to @_nikanono for this art piece! Way of the Cobalt Soul monks get a huge boost to their abilities at level six. Remember how frustrated Beau was when fighting the Gear Keeper because none of her attacks were magical? For her unarmed strikes, that ends at level six. Empowered by her ki, all of her unarmed strikes now count as magical for the purposes of overcoming that non-magical physical damage resistance/immunity. Monks also gain a ki point (as they do at every level) and a boost to their unarmored movement speed (now 45 feet per round). If Beau was to combine her movement, action, and bonus action (Step of the Wind) to move, she could go 135 feet in six seconds (15.341 miles per hour or 24.687 kilometers per hour). If Caleb were to cast Haste on Beau to give her an extra action and double movement speed, she could go 360 feet in six seconds (40.91 mph or 65.84 kph). She’s still not as fast as a flying, hasted, dashing Vax (480 feet in six seconds, 54.55 mph or 89.40 kph), but she’s getting there. Speaking of ki, Way of the Cobalt Soul monks learn two new ways of using their ki at level six. First, they can Extort Truth. 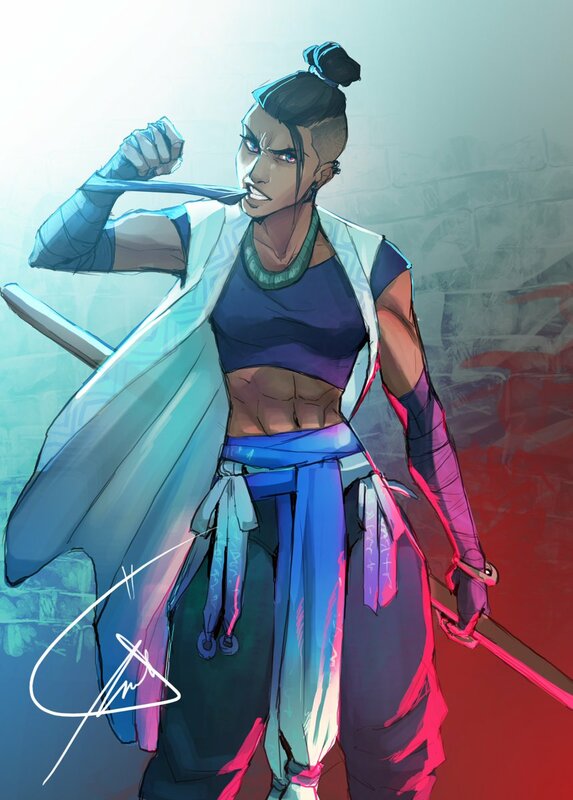 When Beau hits a creature with two attacks in a round, she can use 1 ki point to make the creature roll a charisma save. On a failed save, the creature cannot speak a deliberate lie for 1 minute and all charisma checks directed at them are made at advantage for the minute. Beau will know if it succeeded or failed, and the creature is aware that they’re under the effect. Like Zone of Truth, the affected individual can dodge questions it doesn’t want to answer. Second, Beau gains a Mind of Mercury. She can now, at the cost of one ki point per reaction, take 2 (her intelligence modifier) additional reactions per round, though only one reaction per trigger. That means if Beau decides to use Flurry of Blows to get two staff attacks and two unarmed strikes on her turn, can also take up to three reaction strikes before her next turn, all three of which are affected by her Sentinel feat. As part of the Mind of Mercury ability, she can now also use a ki point to gain advantage on any investigation checks. Finally, as an improvement to her Extract Aspects ability that she gained at level three, twice per rest, Beau is able to use a ki point to learn up to three characteristics about a creature she hits twice in a round. Thanks to @elimnebe for this art piece! Caduceus gains an additional 3rd level spell slot. Like Jester, his Channel Divinity ability can now be used twice per rest instead of just once. He also gains a new ability called Sentinel at Death’s Door. As a reaction, he’s able to reduce a critical hit into a regular hit against himself or a creature he can see within 30 feet, and cancel any and all effects triggered by a critical hit. 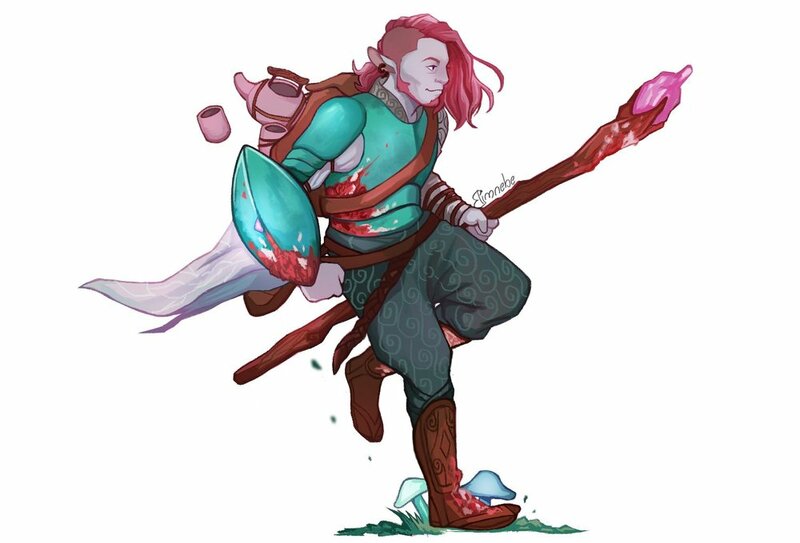 For example, if Caleb were to take a critical hit from Grog that Caduceus chooses to reduce, Grog doesn’t double the dice damage, nor would he roll his Brutal Critical damage. Thanks to Caduceus’ +5 wisdom modifier, he’ll be able to do that 5 times per long rest. Thanks to @MeggieBFox for this art piece! Darkvision (60 feet)- Caleb would finally be able to see in the dark like everyone else! Speed increase (10 feet)- Caleb would now be able to move 40 feet per round. Proficiency in Constitution Saving Throws (that includes concentration checks to maintain spells). Resistance to acid, cold, fire, lightning, or thunder damage (his choice). He can only have one functioning stone at a time, so if he makes a second one, the first goes inert. Thanks to Josh Ketchen (@c_outpouring) for this art piece! At level six, warlocks get a reward from their patron granting them increased abilities. Hexblade Warlocks get Accursed Specter. Once a day, when Fjord kills a humanoid (specifically humanoid, so no beasts, monstrosities, demons, devils, etc. ), he can force the spirit of that individual to rise as a specter and obey his verbal commands. The specter has the stats of a Monster Manual specter plus half his warlock level (so 3 temporary hit points for now). It also gets Fjord’s charisma modifier (+4) as a bonus to its attack rolls. It vanishes at the end of his next long rest. Additionally, Fjord gets to learn a seventh spell, though he doesn’t gain any new spell slots or eldritch invocations. Thanks to @domirine for this art piece! Jester, like Caleb and Caduceus, gets an additional 3rd level spell slot at level 6. She also gets a boost to Channel Divinity. She’ll now be able to channel the Traveler twice per day, and gains an additional channeling ability as a Trickster cleric: Cloak of Shadows. She can use her action to become invisible until the end of her next turn, though she becomes visible if she attacks or casts a spell. She put this to use while riding in the cart with Nott in Episode 30. Nott gets to choose two more abilities she’s proficient in and gain expertise in them (double her proficiency bonus added to those skills). Her Fury of the Small damage also increases to 6 once per rest. Thanks to @Ibzegoej for this art piece! Yasha now gets four rages per long rest. As a Path of the Zealot barbarian, she also gains Fanatical Focus. Once per rage, if she fails a saving throw, she can reroll it; she must take the new roll. Her Healing Hands can now heal for 6 points per long rest.